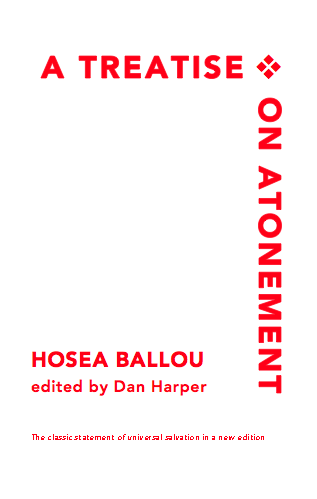 Now in print: a new reader’s edition of Hosea Ballou’s classic statement of universal salvation, A Treatise on Atonement. This new edition has been edited for clarity and ease of reading. I broke up long paragraphs, modernized punctuation, and added section breaks where there was a logical break in the text. I also added an extensive general index that references names, topics, etc., and also references Ballou’s entertaining illustrations and parables. Scriptural references have been added in the text where missing, and there is a full scriptural index. An appendix has a brief biography of Ballou, written by Thomas Whittemore a year before Ballou’s death. This project started almost a decade ago, when I couldn’t find an adequate online edition of Ballou’s Treatise. Scott Wells, Russell Allen, and Steve Rowe all helped produce the Web edition, which went online in 2011. This new print version represents a complete revision of the online edition, with added indices and appendix. Why bother with a new print edition when the classic Ernest Cassara edition, published by the Unitarian Universalist Association, is still in print? Most importantly, the text of the Cassara edition retains the crazy-long paragraphs of the early nineteenth century editions; adding new paragraph breaks makes the book much easier to read. Then too, I’ve long felt that the index to the Cassara edition was inadequate. Finally, after Cassara’s death earlier this year, there was no longer any hope that he might revise his edition. The new 2015 edition of A Treatise on Atonement is available now through Lulu.com for $12.99 plus about $3.99 for shipping. In approximately 8 weeks, it will also be available direct through major online booksellers, as well as through bookstores via Ingram distributors, at a retail price of about $12.99 (the minimum price I can set that allows such wide distribution). Traditional Christianity, which still dominates the United States, sets up a hierarchy of worth among human beings: all humans may be ultimately equal in the sight of God, but those who will be saved upon dying (sometimes phrased differently: those who accept Jesus as their personal savior, those who are Christians, etc.) will go to heaven and everyone else will not. The humans who get to go to heaven thus feel that they are more equal than the rest of us. There’s a good name for this theological viewpoint: it is called the “limitarian” viewpoint because the number of humans who get to go to heaven is limited. Traditional Universalism, by contrast, leads us to a radically egalitarian viewpoint: all humans will be saved, all humans will go heaven upon dying. The conversion experience for traditional Universalists is not an experience of relief (“Whew, now I’m one of the ones who gets to go to heaven!”); the Universalist conversion experience is an experience of happiness upon knowing that we all get to go to heaven (“Wow, now I realize that we’re all worthy of God’s love!”). Today I attended the annual Macedonia Church Singing, a group of people who have been singing shape note hymns on Sand Mountain in Alabama for generations. This is one of the few parts of the country where churches sing in four part a capella harmony from the The Sacred Harp, a four-shape note hymnal, in regular Sunday services. Thus, liturgically speaking it is one of the more conservative parts of the United States; they still conserve some of the old ways of conducting Sunday services that date back a hundred and fifty years or more. At lunch I sat down across from a fellow who was also singing in the bass section, and when he found out that I was a Unitarian Universalist he grinned and said, “I’m a Christian universalist.” We spent the rest of the lunch hour talking about James Relly — when he found out I hadn’t actually read Relly, he said I simply had to do so — and about Rob Bell, and the Primitive Baptist Universalists, and Hosea Ballou. He probably knew more about universalism than I did, although I was able to tell him one thing that he didn’t know: that Abraham Maxim, one of the composers in The Sacred Harp, had been a Universalist. It turns out that he belongs to a Methodist church, where he is a Bible study leader. When he became convinced of the truth of universalism, he offered to step down as a study leader, but his church thought it would be fine if he stayed on. I asked about his pastor, and he said that his pastor seemed to have universalist leanings, though of course he didn’t come right out and say so, he just never preached about hell. You just never know when you’re going to run into another universalist.